NAIROBI, Kenya, May 8 – Safaricom is the latest firm to enter the highly competitive digital TV sphere. The company launched its Set Top Boxes, which will enable subscribers to view TV content and also access the Internet. Dubbed the ‘The BigBox’, the android powered device will offer over 30 TV channels including free-to-air local channels. The decoder is the company’s first product since the launch of its newly optimized 4G network. Its uniqueness lies in its ability to allow its subscribers to access TV content on High Definition format as well as watch content on demand through online video services such as YouTube. The digital box offers integrated home entertainment solutions in that its Wi-Fi hotspot can serve up to ten people at a time. “Our vision is to enable a differentiated broadband Internet solution that will enable our subscribers to harness the power of the Internet to watch new and exciting content from anywhere n the world from the comfort of their homes,” Safaricom’s CEO Bob Collymore said at the launch. The company offers two payment options to its customers. The first option is purchasing the decoder at Sh9,999 whereby customers will access all free-to air channels, up to 6GB in data bundles a month and free YouTube access. In the second option, customers will part with Sh4,999 with an additional monthly fee of Sh999 which is to be remitted for six months. “Customers will be able to top up their balance by buying monthly bundles using their airtime or M-PESA using their predefined USSD and WAP interfaces,” Collymore said. The digital box is up against devices such as Multichoice’s DStv and GOTv which are key market leaders. It will also have a face-off with Zuku which offer similar services that include digital TV channels and monthly subscription to the Internet. Other companies that recently joined the digital boxes space include Radio Africa with its Bamba TV decoder. Safaricom said that it is targeting an estimated 2.4 million households out of the 3.2 million households that have access to digital television sets but are not using any of the boxes that are circulating the market. Safaricom’s head of business development, Sylvia Mulinge, added that the company is working towards serving Kenyans through as many screens as possible, thus their decision to launch the Set Top Boxes. 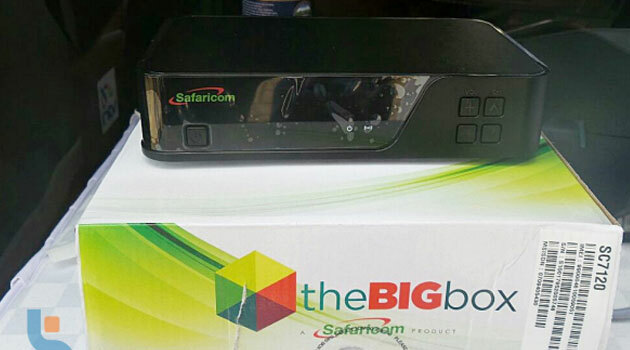 Customers will be able to purchase the Set Top Box from all Safaricom shops countrywide. They will also be available in all major cities across the country. The firm recorded a 38 percent increase in profit after tax in full year results released by the company on Thursday. M-PESA contributed 20 percent of total revenue while mobile data revenue grew at an impressive 59 percent, driven by an increased uptake of affordable data bundles and a 21 per cent growth in 30-day active data customers to 11.6 million.